I wanted to do a Christmas table that was different. Something fresh, crisp and clean. 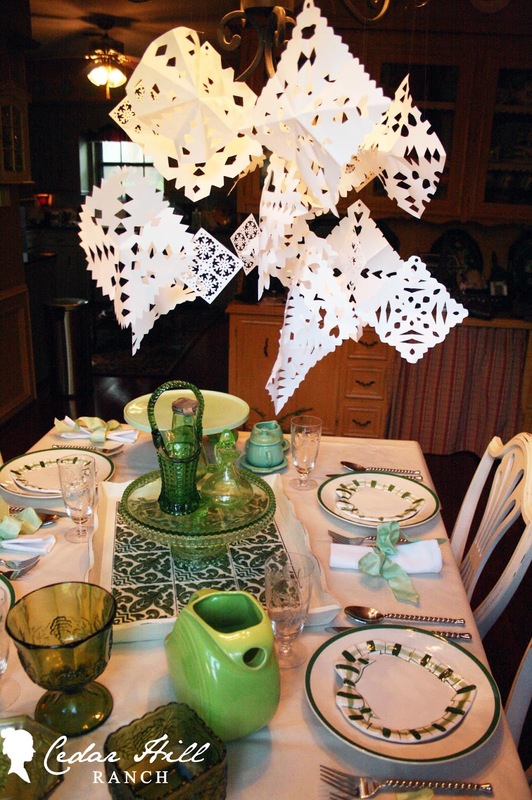 I decided on a green and white table with snowflakes of course. 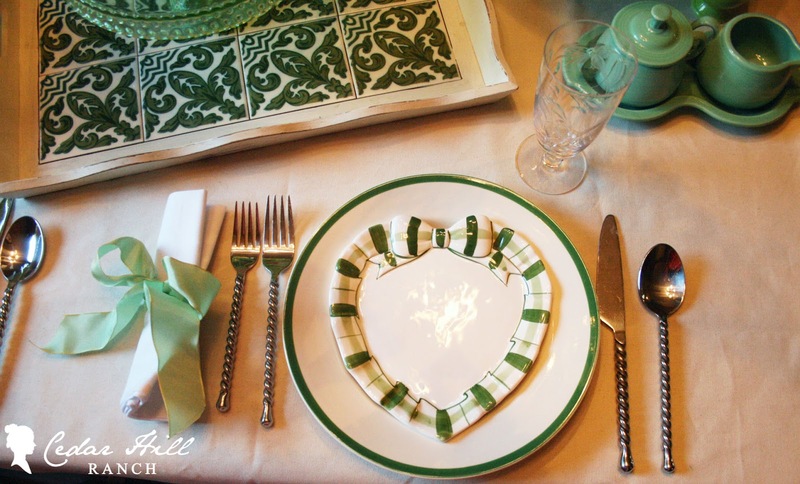 I used my Spode Christmas plates and some hand-painted green ribbon heart plates. Green ribbon for a simple napkin ring added more of my green color to the table. I decided to use my twisted flatware for this tablescape. and my green Fiesta disc pitcher. And now another look at the whole table. The embarrassing thing? I didn’t even know that I collected green things. In my defense, half of these things were inherited. And to top it off, my daughter and I cut out snowflakes to hang from the chandy. I wanted to buy a punch to make snowflakes, but they were all too small. I was thinking I would have to abandon this project idea since I wasn’t able to find the punch I needed. Instead, I decided that I could just make the snowflakes the old-fashioned way with a scissor. In the end, I did buy a Martha Stewart punch at Hobby Lobby that I used for some of the snowflakes. It took four punches to make each one of these. For most of our snowflakes, I made them by hand. When my fifteen-year -old came home from school and saw me making them, she jumped right in to help. This one with the hearts is one she made. I think everyone knows how to do this, but just in case you don’t, here is what we did. First, we took 8 1/2 by 11 sheets of paper and cut them down so that they were square. (We made them different sizes, but the biggest was obviously 8 1/2 by 8 1/2.) After cutting the paper, we folded the sheet in half. Then we folded the paper in half again. Next, we folded the paper on the diagonal. until we decided we were done. Now time for the big reveal, when we got to see what the snowflake looked like. Finally, we punched a hold in the top of the snowflake, and used clear plastic thread to tie them on the chandy. Now that was s fun project. 1. Be sure the snowflakes don’t block the view of the people across the table from you. 2. If your chandy is close to your table, cut the paper down even smaller for smaller flakes. 3. You can look for a snowflake punch, but they are much more fun to make by hand. 4. And the biggest lesson I learned? Teenagers still like to do things with their moms. 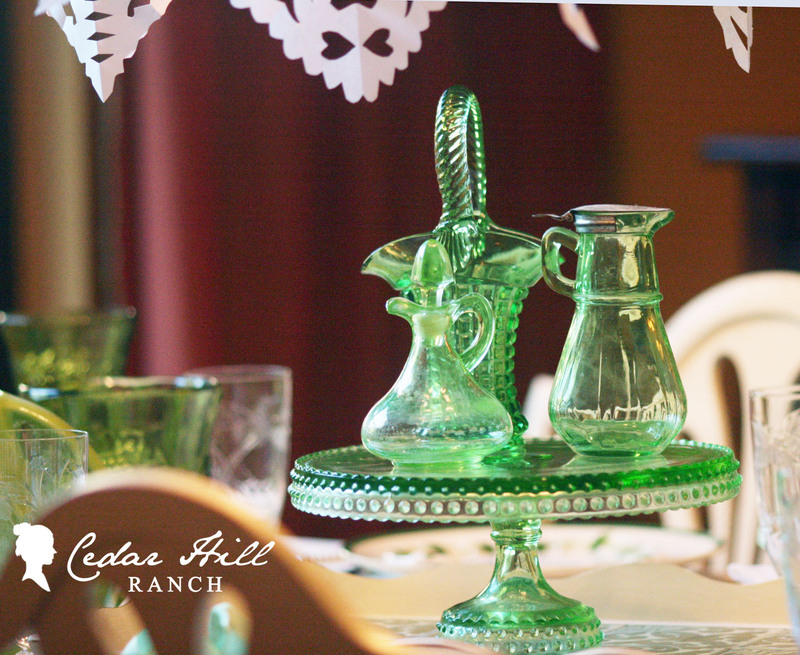 Your green and white table setting is so beautiful! I especially love the homemade snowflakes that you and your daughter made! It adds something special to the room! Love your taste of life. Green and white is so matching with every piece setting. I also love the painting of poppies. I love this, Anita! The chairs are perfect for this table! I love the use of special vintage items in your table! It makes it even more lovely to know the story. I had almost forgotten about making snowflakes! They look great hanging from your chandelier! Thanks for such an inspiring piece! Merry Christmas! All the green and white is just lovely together. Loved seeing all your inherited pieces. Green and white, indeed! Lovely! I am coveting those chairs (although I don’t know how you have room to store so many extras) and those vintage crystal stems – lovely! You win for most beautiful table setting. It is really pretty, and the shot where you can see the room, it looks so inviting. I’m now picturing snowflakes like yours over our Christmas table! I love the soft hints of green! Oh how i wish i would have a formal dining room sometimes!!! The green and white is such a fresh and pretty look for the holiday. All of that wonderful depression glass and I simply love your snowflakes…perfect! Merry Christmas. You’re right!! Fresh and crisp. So lovely!!!! Always enjoy your posts!!! Are you guys getting rain? We are!! Praise the Lord!! Blessed Christmas to you and all your family!! Love the mix of the different green pieces. Oh Anita I love it all!! That second picture down that you softened is gorgeous!! very beautiful post. The green sparkles with the crisp white background. I just think less IS more when it is done right like you did ! Love all the greens! I have the same syrup container, and I really like the plate stand. Beautiful table. SO glad to know that teen years can be sometimes ok. My oldest is 12. Here we go! Love the white and green! It is pretty and unexpected. Your tablescape looks Beautiful with the greens and white mix together. you did a lovely job putting this all together for the Christmas Holidays. Thanks so much for your sweet comments on my new Blue Tablescape for Christmas. I hope you and your family have a wonderful week. It’s stunning, and I adore the snowflakes hanging from the chandelier!! What a beautiful blog you have here I love your table. I’m new to your blog and have enjoyed looking around, I’m now following you so I can visit you often if you find a spare minute hope you visit me sometime follow back if you like so lovely to find new friends. I look forward to keeping in touch in 2012, Merry Christmas to you and your lovely family. Hi Anita, I was overjoyed to see a new follower this morning. Yay 😀 I am your newest follower too. I am excited to have a new friend in blogland. Merry Christmas! Having a 15-year-old want to hang out with you and not think it’s “lame” or “grody” or whatever slang term the young people are using these days is really special! Those times seem to become so few and far between when they reach that age, so I am glad you were blessed with that chance to do a project together, have fun and reconnect. AND the project turned out really great!!! I can remember making snowflakes in grammar school, but I haven’t done it since. This makes me want to! 🙂 Pretty table with the inherited and collected pieces. Green is such an all-round, versatile, timeless color that can shine in any season. Merry Christmas to you and yours! 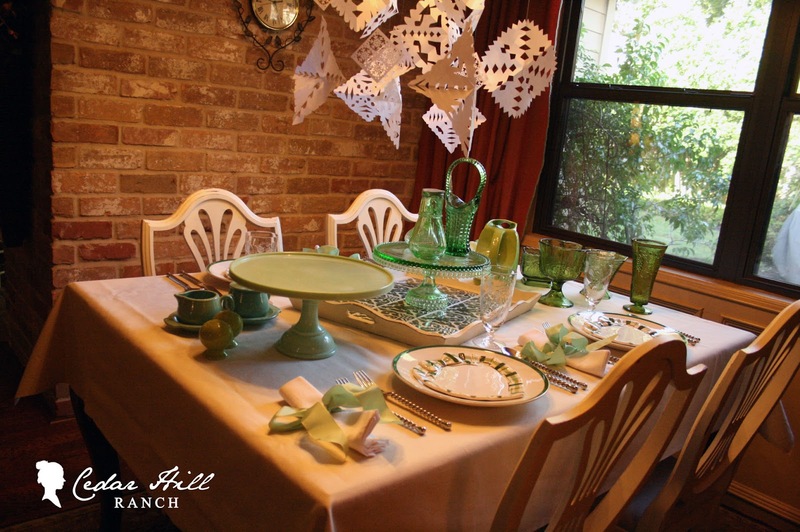 Your white and green table setting is gorgeous!